One thing is certain, we will have tasted the endless climbs. 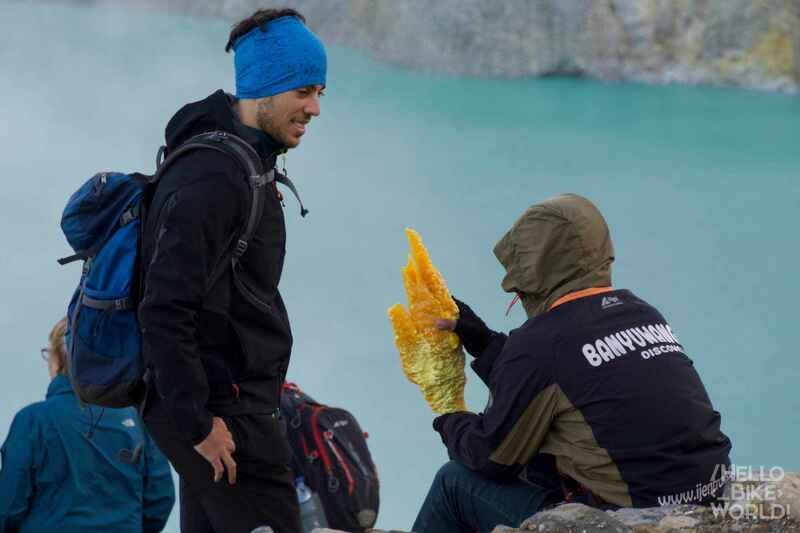 To reach the base camp of Ijen volcano Kowa, must confront two successive passes : the first to 1600m, then down to 1000m to raise the second to 1900m. 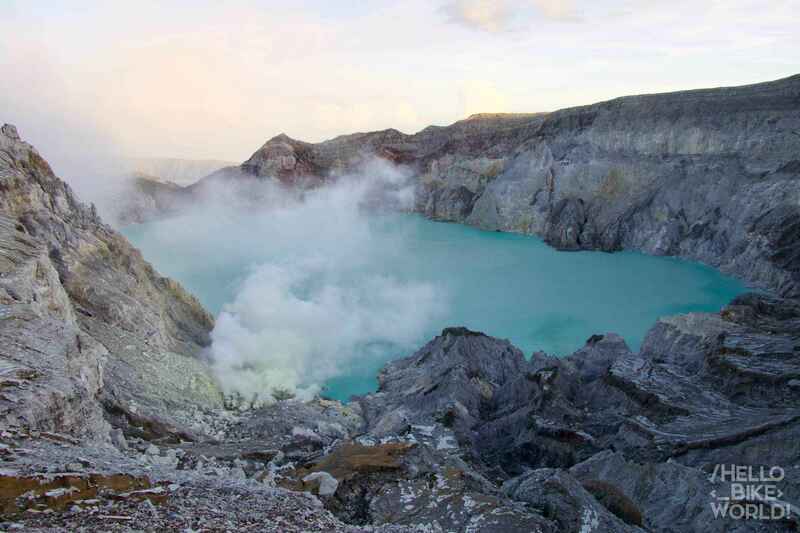 Located in East Java, This active volcano is well known for its turquoise blue lake and its sulfur exploitation. Organized tours normally start at 2am. Why so early ? For the early morning, to 4h, one can observe a very interesting phenomenon : blue flames ! Sadly, the entire park was closed last week for thirty tourists were poisoned by violent sulfur fumes. Since two days, the park is open again but this morning, we can start the hike only from 4am until noon. The descent to the crater is forbidden ... so no blue flames for us. We pitched our tent on the campsite which is located just from walking next to the window for entrance tickets. rather practice, and especially free ! Not very glorious moment after waking. Despite appearances, in fine fettle ! It was at 3:30 that we open our eyes, awake for once not by a muezzin, but by an ordinary phone alarm. Our motivation and the idea to go to the top of the volcano, however, enough to quickly get out sleeping bags. 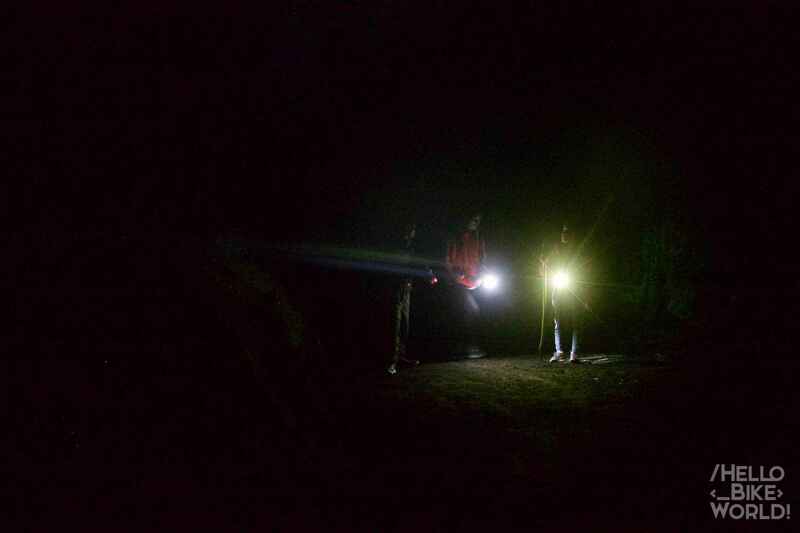 After a nasi goreng morning, we pay the park entrance, 100K IDR each (is around 8$), arm ourselves with our headlamps and begin the steep climb to the top. Our training bike passes which helped. 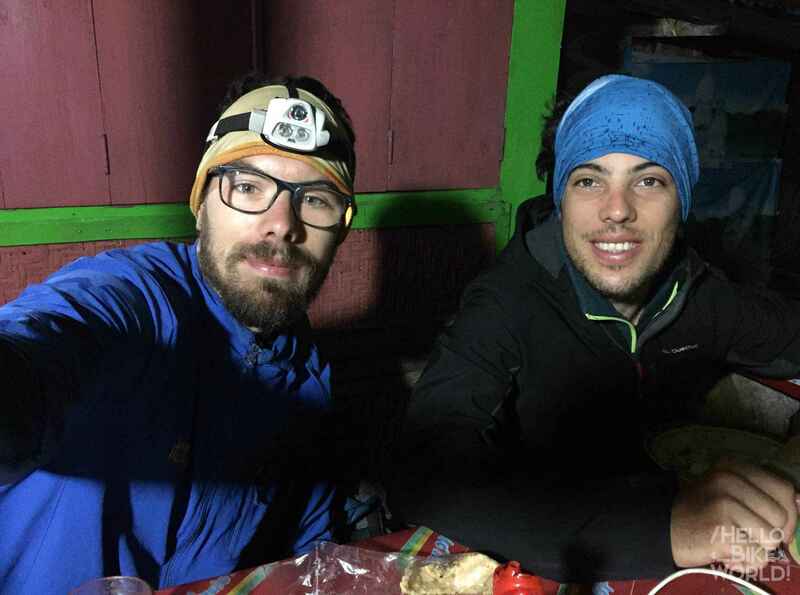 While the indicated time is 1:30 to get to the top, we come to the end in just 1 hour, doubling the exhausted tourists who barely had time to blink that we are already far ahead of the next corner. I hardly exaggerate. 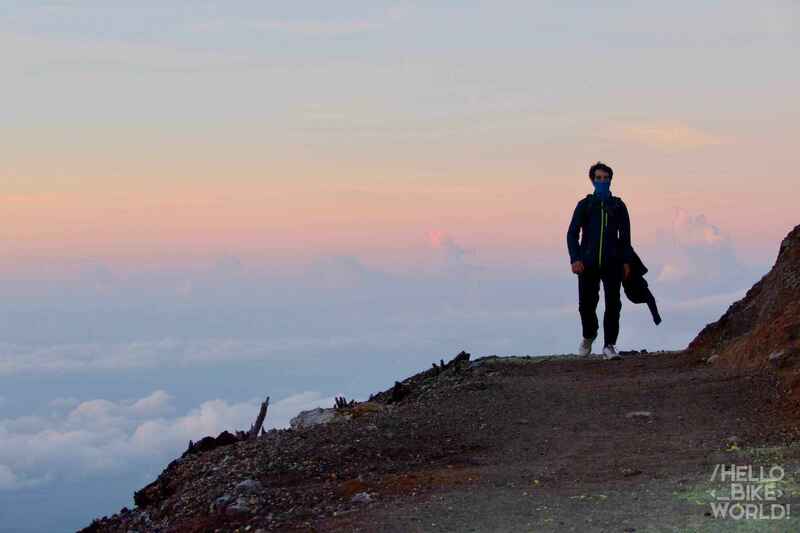 Just before the top of the summit, the "Supermineur" – that's how he presents himself, I think it sounds good. 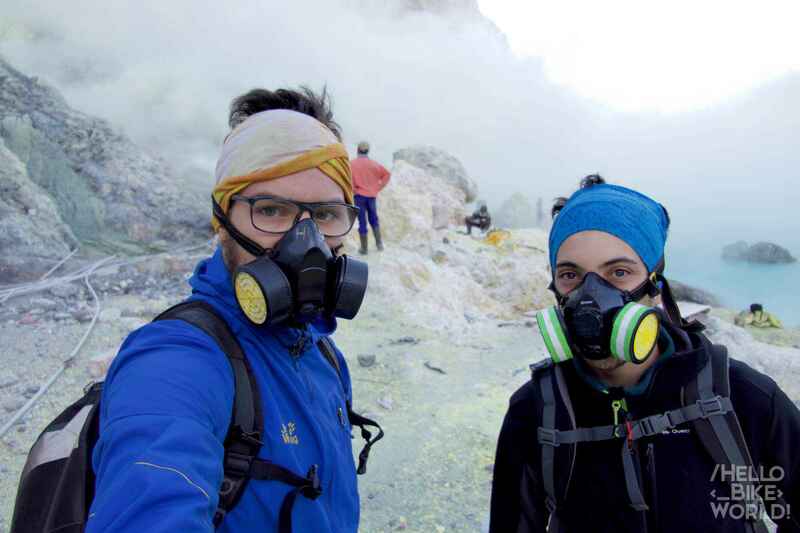 – we are to take his gas masks because supposedly, Sulfur emissions are particularly strong this morning. I wonder if it's mandatory, he replies that yes. Good, good ... We rattle a little because at the entrance, nobody told us anything compared to gas masks. 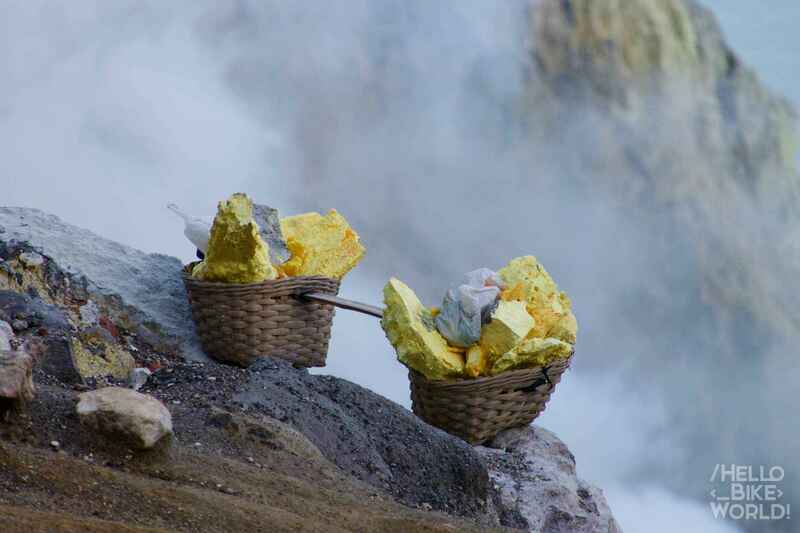 We read the rules of the day yet : 1km from the crater, simply either a gas mask, either a wet tissue. obviously, we opted for the latter, more economic. We leave two large 50K IDR tickets (4$ each) and receive two "beautiful" as effective gas masks pleasure to wear. You would have understood it, we are very happy with this purchase forced. 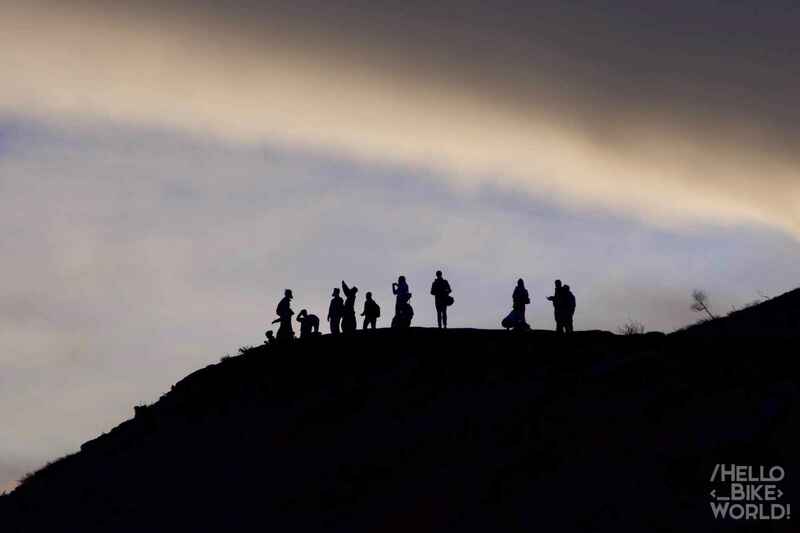 After the last 15 minute walk, we reach the top of the crater, accompanied by the beautiful lights of the sunrise. 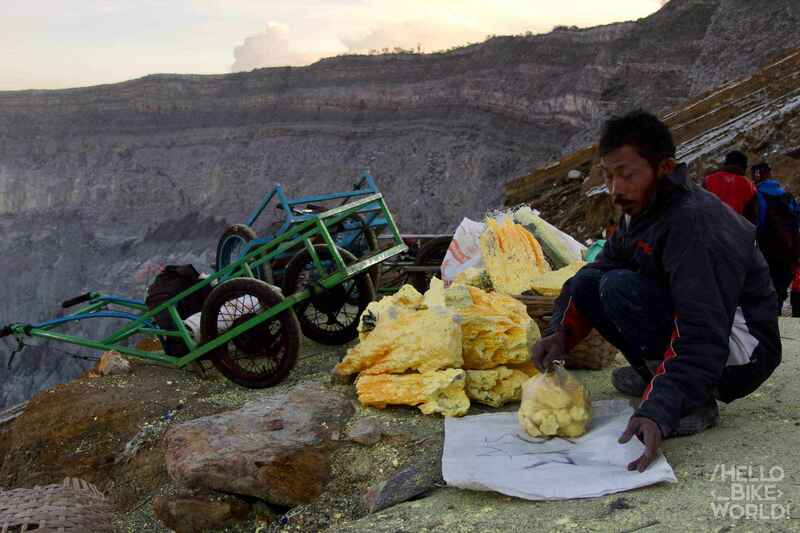 We meet the first carrier / sulfur miners. Up, the wind is contrary so there is no gas hazard in our direction. No mask holder. We have been fooled, literally. It will instantly that brain awakening, a little slow to start. 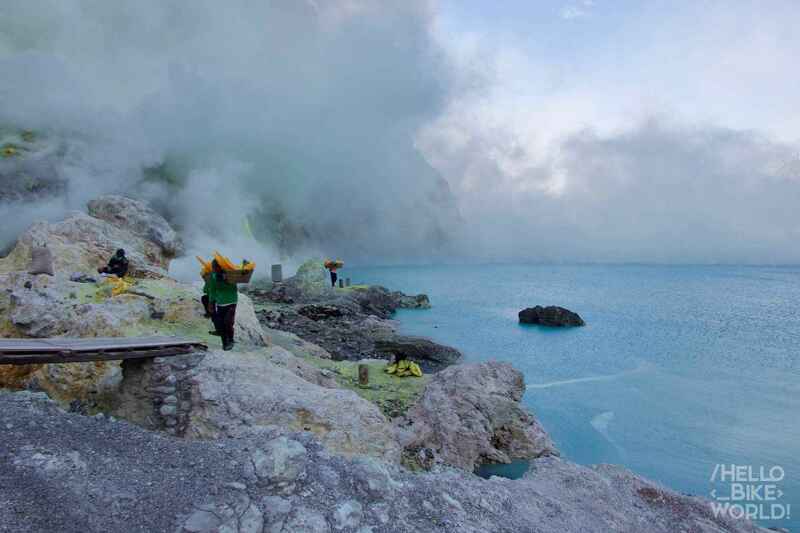 The lake is turquoise and the smoke is white with yellow-green hues. This is absolutely great. After about twenty minutes of observation, we are about to go around the crater when we meet a French air a little rebel who rises from the crater floor. He says frankly it's worth the shot. It is true that now that we have the masks, so use it ... 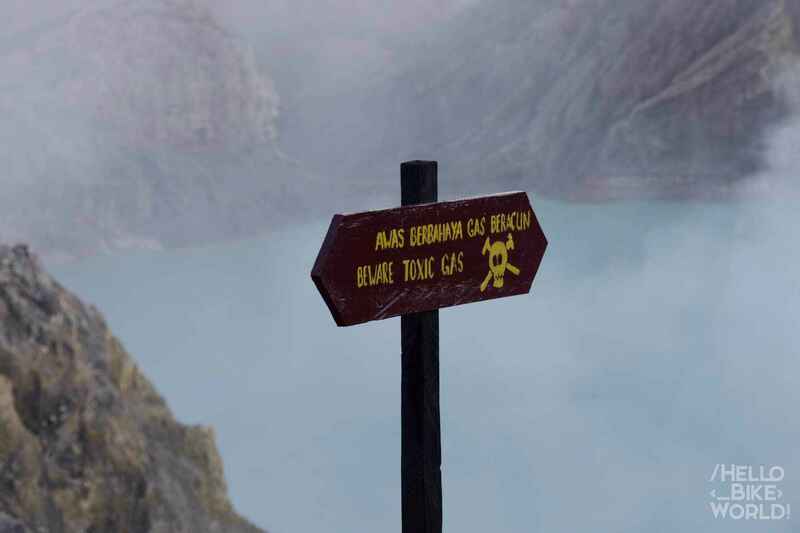 Especially that no one controls access to the crater lake, normally forbidden to tourists. And minors in all this ? Minor to medium toxic gases, undermining for his life, at the expense of his life. 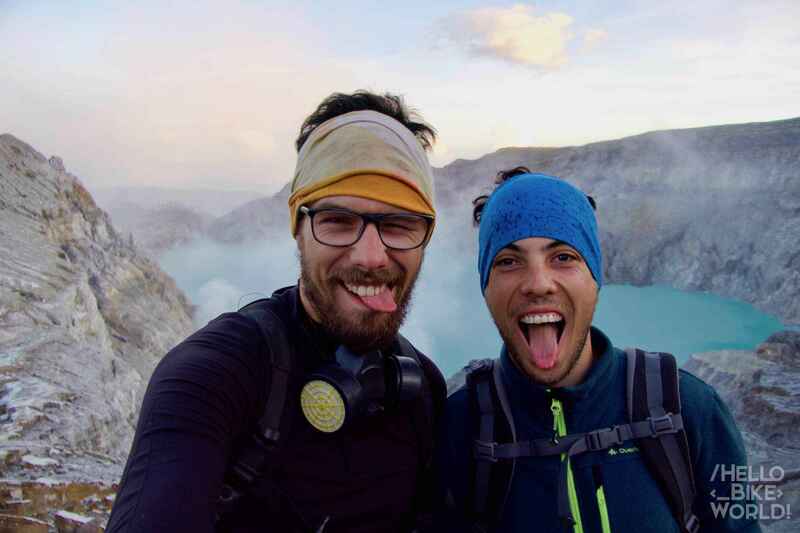 "We will go down into the crater," said Kilian. I agree, much use, these famous masks. We descend carefully rugged way down the crater, regularly crossing these on-men, a slow walking but insured, back their sulfur Bag. A path made of steps would be far too easy for them ! 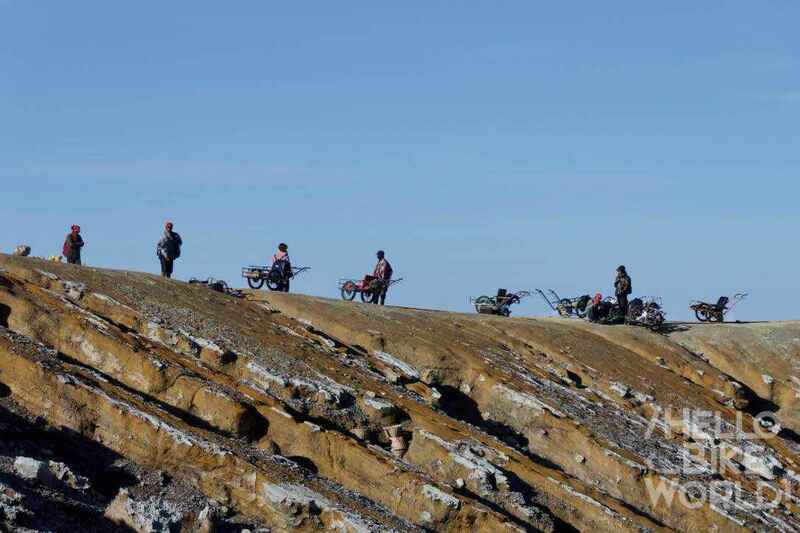 It is in the midst of a chaos of boulders and loose rocks they make their return trips. We are down. 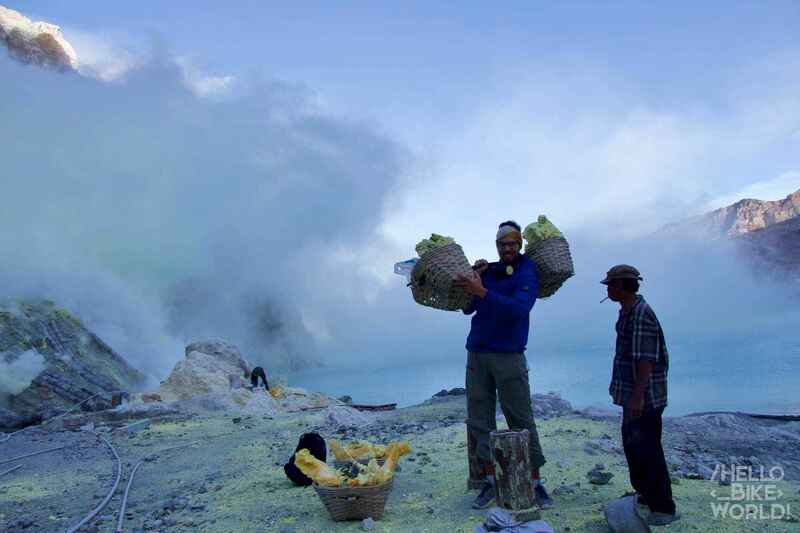 A poignant smell of sulfur takes our noses, and throat. It's time to put the masks. We feel that the gas passes through anyway. We made doubly rolled. We feel that we should not hang, a block from the exhaust of toxic gases from the bowels of the planet. I ask a minor if I can try to carry his bag. First I bent down by bending the legs to drag my shoulder under the wooden bar. Then I try to unfold my legs to get up. Without my training trike, not even think about it. I get up with great difficulty, the feeble knees. I'm up ! It's a miracle. The unstable loading threatens to fall. Yes, it must also manage the center of gravity of these unusual dumbbells. I absolutely can not move my shoulder and already suffering. I based the infernal loading. here, I held two seconds. I am even more amazed now, seeing holders climb the vertical rise of 300m. Despite all the training they can have, their shoulders, legs, will never recover. 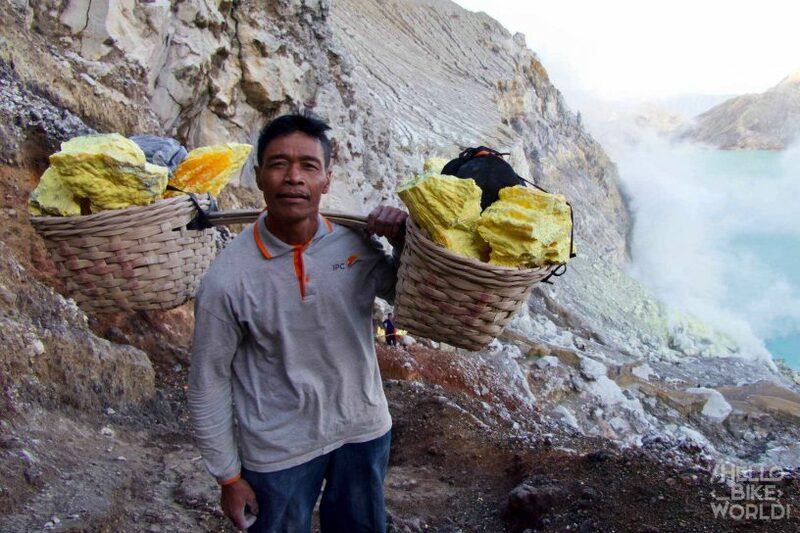 Once sulfur top, the work is not completed because it will deliver the semi-precious rocks down the volcano. 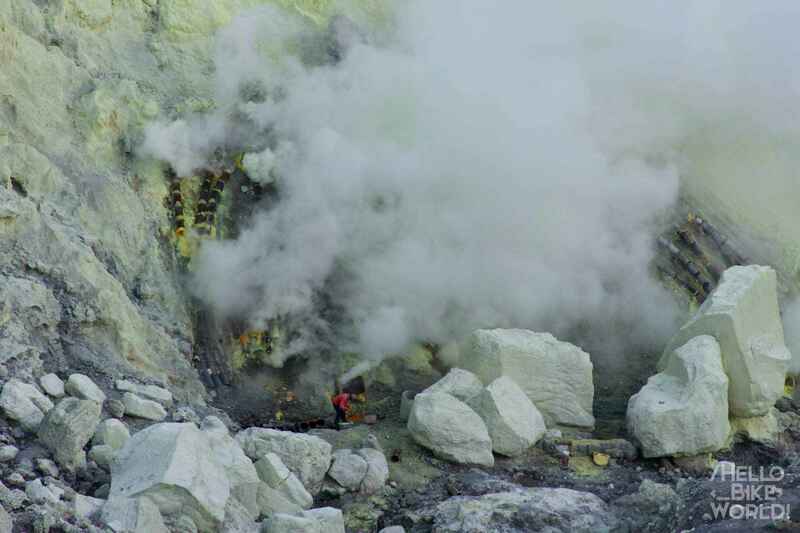 The sulfur is then placed in small carts. Too easy ! Oh no indeed, because it must retain heavy trucks with all his strength downhill. We go back to the top, blowing but without sulfur and without suffering. Vapors gas make us turn some heads, we feel a strange taste in our saliva… But it's nothing, only 10 minutes at the lake. Nothing compared to 6 hours per day in this hostile environment for minors. good job guys! 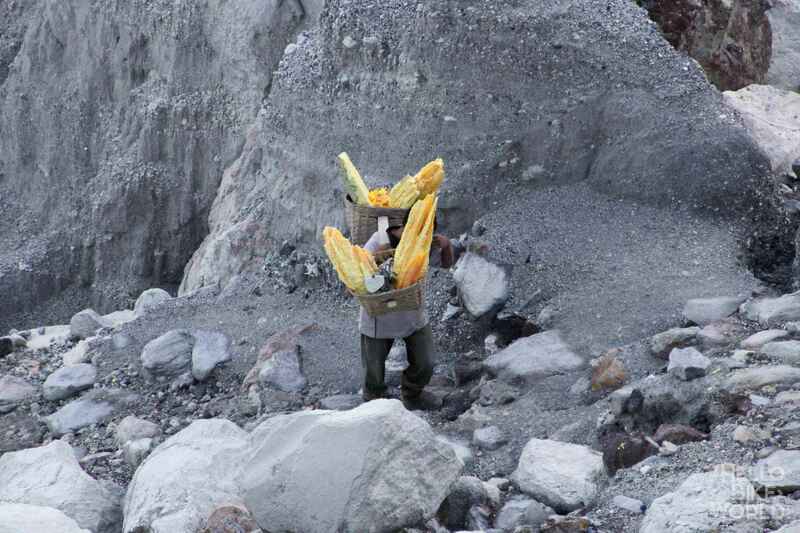 I saw several reporting on these miners suffer. Outrageous these private companies that exploit the misery of the poor and the workers' health. The resilience of these children is phenomenal! Fabulous, scarcely credible… a bad pun to relax the atmosphere… Take the mask !